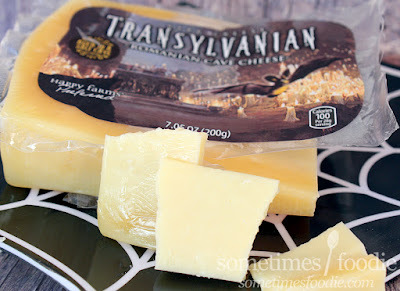 And now for something completely different... Transylvanian cheese! I originally planned on doing one more that night...but the lack of sleep and massive sugar intake caught up to me. An unplanned nap-attack ended my night prematurely (how lame), but that won't stop me from finishing what I started! Now, I would like, if I may, to take you on a strange journey. 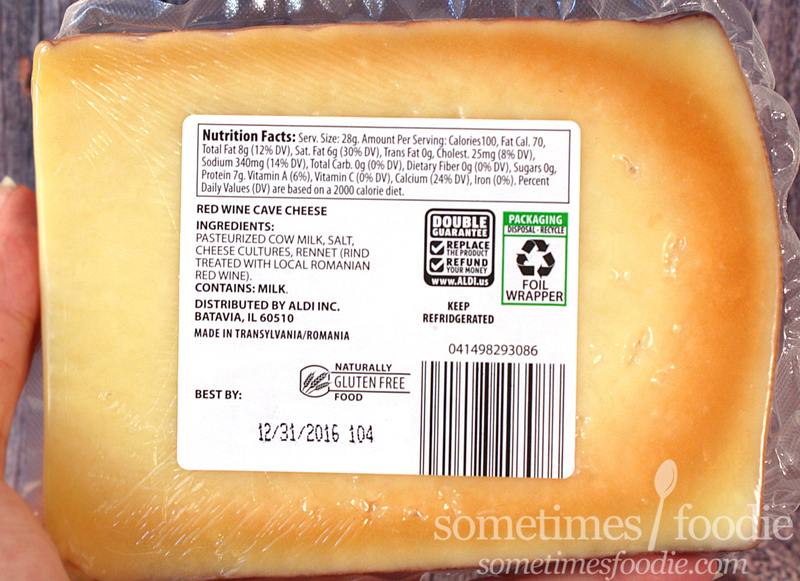 Both cheese wedges have very simple packaging. Each slice is covered in shrink-wrapped plastic and topped off with some spooky stickers. 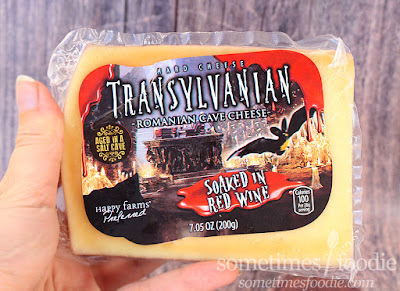 Normally Halloween themed packaging can be cheesy, but I really like the cave and bat imagery they went with. It's playful and fun, but it still looks kind of serious, like this might be some really decent cheese under all that novelty imagery and plastic. The fake blood effect on the wine version is a little over-the-top, but I still dig it. I peeled back the plastic and each slice has a wax encasement around the edges. The red wine one is a bit darker than the normal salt-cave version, but they're both pretty thick. Once you remove the rind you don't get all that much cheese, which was a pretty big downer, but fancier cheese tend to come in smaller sizes, so I took it as a sign that this should be some pretty good stuff. 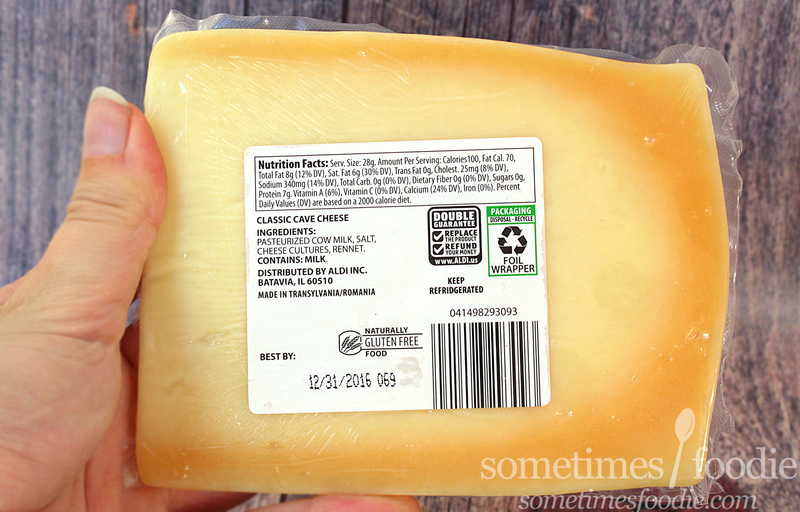 Once opened and sliced, the cheese had a sharp and earthy aroma. I'm no cheese expert, but it reminded me of the complexities and creaminess of Gouda, without the smoke, and the dryness of sharp white Cheddar with a hint of the savory, salty-goodness that is Parmesan. Halloween novelty product or not, this stuff smells GOOD! If it tastes half as good as it smells I'm going to need another slice. I took a bite on the normal version and it's good! Very good! Especially for a Halloween novelty. It's creamy, salty, a little nutty, and sharp. 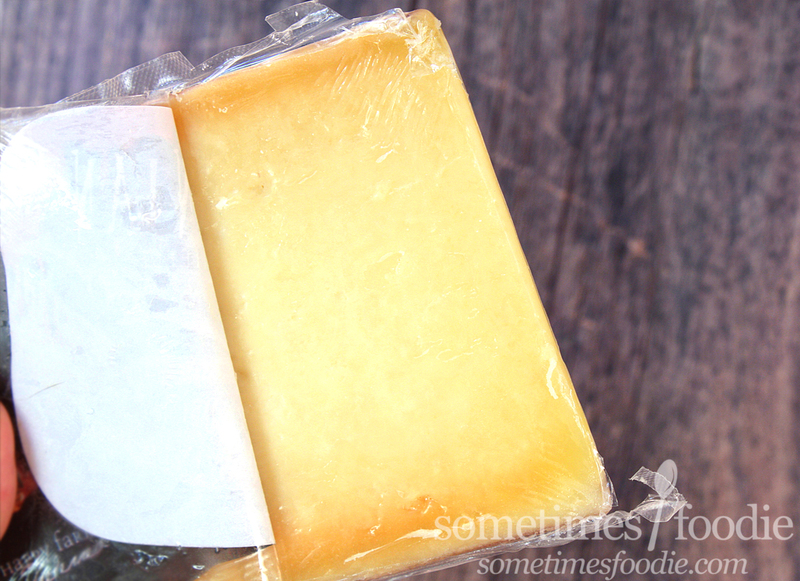 I could see this pairing very nicely with wine and crackers, but who are we kidding? I'm no classy wine drinker. I'm just going to eat it as-is while I watch bad horror movies on Netflix. (I love Netflix but it's horror movie selection, even during Halloween, and AWFUL!.) Next up, the wine version. 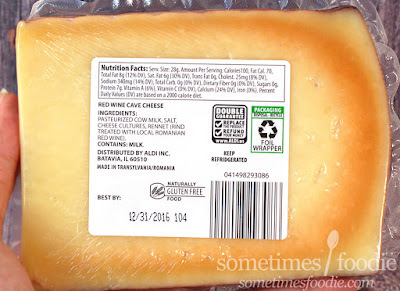 The label tries to make this cheese wedge look entirely different, but other than the rind being a slightly darker color (likely stained by the wine-soak) it looks exactly the same and smells exactly the same. I sliced off a hunk and took a bite...and it's not all that different from the non-wine version. It hard for me to even tell the difference between the two, but after several pieces, I think the wine version does have a slightly deeper flavoring and it seems to be less sharp, but it's not a truly night-and-day difference. Of the two I prefer the normal version, since I really like the slightly sharper flavor, but I wouldn't kick either out of my coffin. For a novelty Halloween offering, I think this stuff is pretty darn awesome! It's got a cute label you'll want to display on your Halloween cheese-board, it pairs nicely with crackers and red wine, and most importantly...it tastes great! I really enjoyed this cheese and I hope Aldi brings it back again next year.